PROPERTY transactions will surpass RM100 billion this year but the sector will not enjoy 35 per cent growth as it did last year, said a government official. Growth may be in single digit or below 20 per cent because there will be more people buying low- to medium-end properties resulting from government initiatives under the 2011 Budget. Datuk Abdullah Thalith Md Thani, director-general of the Valuation and Property Services Department in the Ministry of Finance, said the volume of properties transacted will, however, grow by double digits to more than 350,000. Between January and November 2010, there were a total of 342,179 properties transacted, worth RM96.78 billion. Abdullah Thalith thinks there will be more than RM100 million in sales recorded in December, breaching RM100 billion for the whole year. The RM100 billion mark, a record high for Malaysian properties, would be 35 per cent more than 2009. In 1998, the value of properties transacted was about RM60 billion, with 5 to 10 per cent growth per annum. Abdullah Thalith told reporters yesterday in Kuala Lumpur at the 2011 property market outlook summit that the positive economic outlook and the Economic Transformation Programme will drive growth this year. He said the prime movers will be the redevelopment of the Sungai Besi land, Batu Cantonment army base, Rubber Research Institute land in Sungai Buloh, Matrade project by Naza Group, the 100-storey tower by Permodalan Nasional Bhd and the Mass Rapid Transit project. "If all these projects can start this year, it will uplift the market. We expect more people to buy low to medium-end properties. We also expect movements in the luxury segment, commercial and industrial," he said. KUALA LUMPUR: Newly-listed Tambun Indah Land Bhd (TILB) expects to complete the first of its seven ongoing property projects on mainland Penang in the first quarter of this year. The company will complete the second phase of its RM79mil Juru Heights bungalow project by March, according to managing director Teh Kiak Seng. “We have seven projects ongoing this year with a GDV (gross development value) of RM530mil. They include medium-cost apartments and mid-range housing developments,” he said after the listing ceremony of TILB on the Main Market of Bursa Malaysia yesterday. Going forward, Teh said TILB would continue to develop projects on mainland Penang (as opposed to the island) as properties there were more affordable. 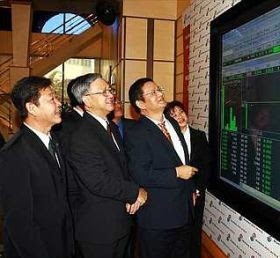 Teh Kiak Seng (second from left) and Tambun Indah Land directors monitoring the company’s share price on Tuesday. “We are getting more purchasers coming to the mainland because they can't afford prices on the island,” he said, adding that it would be more viable for TILB to tap the mainland property market. “The Penang state population is about 1.6 million. The island has 700,000 people. There are more people staying on the mainland and it is also attracting a lot of FDI (foreign direct investments),” Teh said. He cited, as an example, Japan-based printed circuit board maker Ibiden Co Ltd, which has invested in a RM1bil plant at Penang Science Park. He also mentioned Nasdaq-listed Rubicon Technology Inc, a leading global light-emitting diode (LED) manufacturer, as well as US-based Honeywell Aerospace, a leading provider of avionics and electronics, which have also invested substantially in the mainland. “Connectivity (in Penang) is also being improved with the construction of the second Penang bridge,” Teh said, adding that the Federal Government had big plans to develop Butterworth. Teh also said the Penang mainland property market was more active and had better growth prospects. “During the recession in 2009, the Penang island property market grew by 0.3%, but mainland Penang grew by 9.3%,” he said. According to Teh, TILB has a land bank of close to 300 acres, all located on the mainland. On another note, Teh said the company had set a dividend payout policy of 40% to 60% of its annual net profit. TILB recorded a net profit of RM25.37mil for its financial year 2010. The company opened at 80 sen and closed at 80.5 sen, a 10.5 sen premium over its issue price of 70 sen. A total of 41.5 million shares were traded, making it the second most active counter of the day. PROPERTY developer Bolton Bhd is looking to expand its landbank in Penang with a potential acquisition in Teluk Kumbar this year. Bolton executive chairman Datuk Azman Yahya yesterday said it was hopeful to conclude the proposed acquisition of the 44ha site within two to three months. The land on the south-western end of Penang island is estimated to cost Bolton RM150 million, Azman added. "Our maiden project in Penang - Surin, has been encouraging and we are now looking at expanding our landbank on the island via acquisitions and joint ventures," he told reporters after a topping out ceremony for the Surin Tower B project located in Tanjung Bungah. Surin is a two-block 28-storey luxury condominium project which is built on a freehold parcel of elevated land and carries a development value of RM199 million. Of the project's 390 units, about 77 per cent had already been sold out and about 30 per cent to 35 per cent of the buyers were foreign, Azman said. The units, which were sold at prices ranging from RM345,998 to RM1.2 million, offer amenities such as an infinity pool, rooftop garden, two covered carpark bays per unit, three tier security, a barbeque area and sky decks. On the planned purchase of the Teluk Kumbar land, Azman said Bolton was looking at building landed property units, along with apartments in a gated community. "Our target investors for this proposed project would be locals," he added, saying that Bolton remains on the lookout to buy land in Tanjung Bungah. "We remain convinced of Penang's vibrancy and growth prospects and we are actively looking for development opportunities. "The residential market remains buoyant and this is a segment which we want to focus on," Azman said. In the Klang Valley, he said the company will soon unveil a block of luxury serviced residences at Jalan Bukit Ceylon, an exclusive gated community in Ukay Perdana, and the 51 Gurney development. The latter project is touted as Malaysia's first and only super luxurious condominium which comes complete with spacious driveway on every floor and a car park within every unit. AXIS REIT Managers Bhd has reaped RM16.16 million profit in its fourth quarter ended December 2010 and plans to distribute 5.25 sen a unit to investors. "Last year, we saw the highest gain in fair value of investment properties for a single year since the listing of the trust," said chief executive officer Stewart Labrooy. He said the company revalued 14 of its stable properties. "It has led to an increase in the net asset value of the trust to close at RM2.009 a unit compared with RM1.842, a year ago," he told reporters at a briefing in Kuala Lumpur yesterday. In the fourth quarter of 2010, Axis-REIT bought three more properties, namely Tesco Hypermarket, Axis PDI Centre and Axis Technology Centre. It also concluded the purchase of two IDS warehouses in Seberang Prai, Penang. Following these acquisitions, Axis-REIT now owns 26 properties. Its net asset value rose to RM1.18 billion in 2010 from RM884.96 million in 2009. Two days ago, Axis-REIT said it will sell an industrial complex in Port Klang for RM14.5 million by June 2011. "We need to maintain growth by culling smaller assets where the returns have stagnated. We will bring in assets that have capital gain potentials," said Labrooy. "We'll gain RM764,000 from the sale of industrial complex in Port Klang and this will be chanelled back to unitholders," he added. On outlook for 2011, he said Axis-REIT is looking to buy five more warehouses in Johor and the Klang Valley and two more office blocks in Cyberjaya. So far, the company has set aside RM365 million for these acquisitions. Sycal Ventures Bhd's wholly-owned unit, Sycal Properties Sdn Bhd, has signed a joint venture agreement with Global Net Communication Sdn Bhd. In a filing to Bursa Malaysia today, Sycal said the companies aimed to jointly develop three plots of land in Kuala Lumpur into a high-end residential villas with estimated gross development value of RM70 million. It said the development would contribute positively to the construction order book of Sycal Group.